The Goodness of Granola! | A Bit of Nutmeg! One of the disappointments of living gluten free is that there really aren’t any good grab and go snacks! OK, well maybe there are……but they are NASTY; all dry and crumbly and not very good tasting! LOL! I miss the easy days of going to the store and having a seemingly endless supply of snacking options! What i miss the most though, are those deliciously crunchy little honey bunches of oats clusters! Yuuummmmmm! 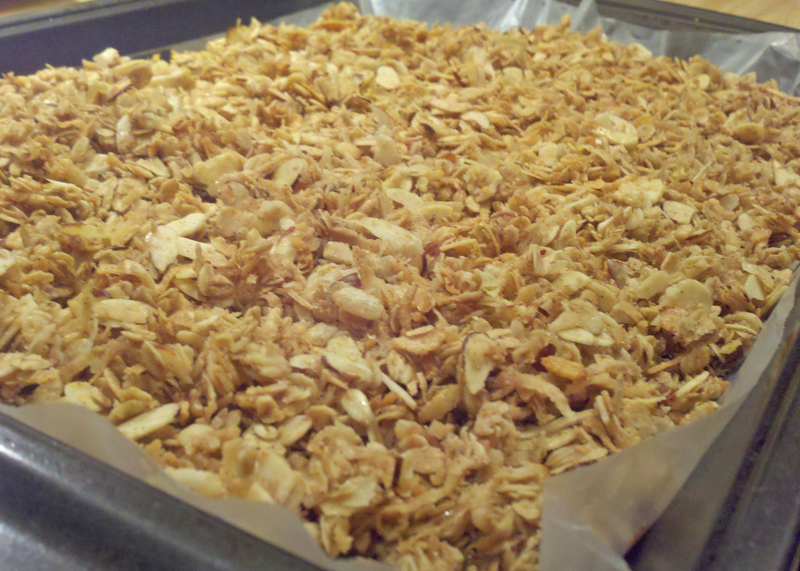 Trust me, after searching for gluten free granola…..I decided to just make my own! I know its all personal preference on taste; some people like all the healthy little seeds and grains and interesting things that I’m not so fond of! But I just want BASIC granola goodness! 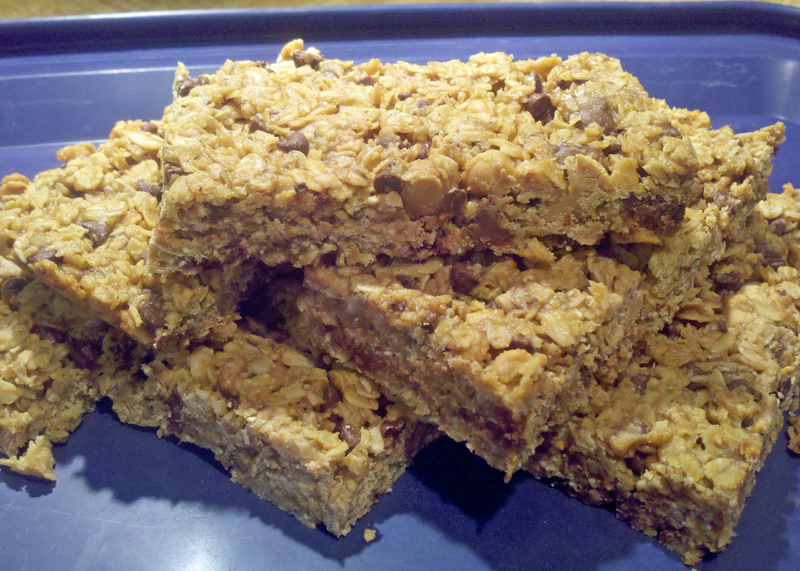 And granola bars ~ the yummy chewy ones that don’t break into a million pieces with the first bite. (If you’re like me its usually in the car running late to something and snacking on a granola bar, which then ends up in every little crevice of the car!) So having finally found and molded these recipes into something wonderful, I’ll share them with you now! I like to freeze the granola bars in individual snack size bags and then take them out of the freezer as i need them. They only take about an hour to thaw. I do this with oatmeal cookies too, I have a couple of REALLY good recipes which I’ll probably make and share soon! 🙂 The granola is great to just snack on or throw on some fruit! Hope you enjoy these recipes as much as I do! Preheat oven to 250 degrees F. In a large bowl combine the oats, nuts, rice krispies, coconut, brown sugar and cinnamon. In a glass measuring cup combine the syrup, oil and salt. Pour onto dry ingredients and mix so its evenly covered. (I just use my hands) Pour into a large roasting pan lined with wax paper and spread out evenly. Cook for 1 1/2 hours stirring lightly every 30 minutes. If you under stir it will stick and brown, over stirring will break up the clusters! Remove from oven and mix in the dried fruit if desired and let cool on pan. In large bowl or mixer (I use my Kitchen-Aid mixer) beat the peanut butter, honey, egg, oil and vanilla. Add the oats, brown sugar and salt, mix well. Mix in chips. Spread evenly into a Pam-sprayed 13×9 inch baking dish, pressing down with spatula to remove any air pockets. Bake at 350 degrees F for 18 minutes. Cool in pan on wire rack. When completely cooled, cut into bars. Store in air-tight container or freeze. Makes 12 granola bars.